Violence may be justified in the service of self-defense, even to the point of killing an unjust aggressor: this has been settled Catholic teaching for hundreds of years. 54. As explicitly formulated, the precept “You shall not kill” is strongly negative: it indicates the extreme limit which can never be exceeded. Implicitly, however, it encourages a positive attitude of absolute respect for life; it leads to the promotion of life and to progress along the way of a love which gives, receives and serves…. 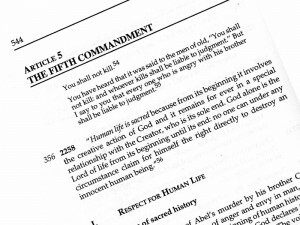 As time passed, the Church’s Tradition has always consistently taught the absolute and unchanging value of the commandment “You shall not kill”. It is a known fact that in the first centuries, murder was put among the three most serious sins  along with apostasy and adultery  and required a particularly heavy and lengthy public penance before the repentant murderer could be granted forgiveness and readmission to the ecclesial community. 55. This should not cause surprise: to kill a human being, in whom the image of God is present, is a particularly serious sin. Only God is the master of life! 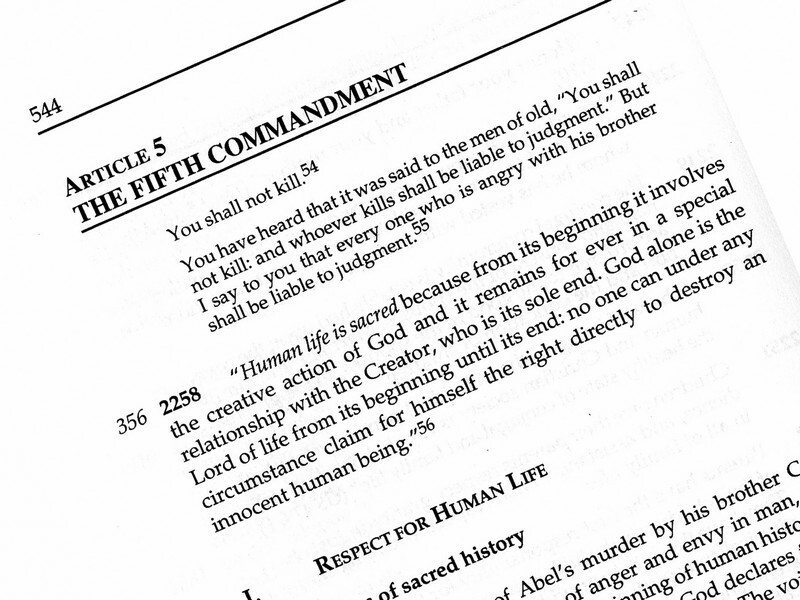 Yet from the beginning, faced with the many and often tragic cases which occur in the life of individuals and society, Christian reflection has sought a fuller and deeper understanding of what God’s commandment prohibits and prescribes. There are in fact situations in which values proposed by God’s Law seem to involve a genuine paradox. This happens for example in the case of legitimate defence, in which the right to protect one’s own life and the duty not to harm someone else’s life are difficult to reconcile in practice. Certainly, the intrinsic value of life and the duty to love oneself no less than others are the basis of a true right to self-defence. The demanding commandment of love of neighbour, set forth in the Old Testament and confirmed by Jesus, itself presupposes love of oneself as the basis of comparison: “You shall love your neighbour as yourself ” (Mk 12:31). Consequently, no one can renounce the right to self-defence out of lack of love for life or for self. This can only be done in virtue of a heroic love which deepens and transfigures the love of self into a radical self-offering, according to the spirit of the Gospel Beatitudes (cf. Mt 5:38-40). The sublime example of this self-offering is the Lord Jesus himself. Moreover, “legitimate defence can be not only a right but a grave duty for someone responsible for another’s life, the common good of the family or of the State”. [The quotation is from # 2265 in the first edition of the Catechism of the Catholic Church.] Unfortunately it happens that the need to render the aggressor incapable of causing harm sometimes involves taking his life. In this case, the fatal outcome is attributable to the aggressor whose action brought it about, even though he may not be morally responsible because of a lack of the use of reason. Nothing hinders one act from having two effects, only one of which is intended, while the other is beside the intention…. Accordingly the act of self-defense may have two effects, one is the saving of one’s life, the other is the slaying of the aggressor. Therefore this act, since one’s intention is to save one’s own life, is not unlawful, seeing that it is natural to everything to keep itself in “being,” as far as possible. And yet, though proceeding from a good intention, an act may be rendered unlawful, if it be out of proportion to the end. Wherefore if a man, in self-defense, uses more than necessary violence, it will be unlawful: whereas if he repel force with moderation his defense will be lawful, because according to the jurists, “it is lawful to repel force by force, provided one does not exceed the limits of a blameless defense.” Nor is it necessary for salvation that a man omit the act of moderate self-defense in order to avoid killing the other man, since one is bound to take more care of one’s own life than of another’s. But what death can be unjust when inflicted on a secret plotter and robber? What is the meaning of our retinues, what of our swords? Surely it would never be permitted to us to have them if we might never use them. This, therefore, is a law, O judges, not written, but born with us  which we have not learnt or received by tradition, or read, but which we have taken and sucked in and imbibed from nature herself; a law which we were not taught but to which we were made  which we were not trained in, but which is ingrained in us  namely, that if our life be in danger from plots, or from open violence, or from the weapons of robbers or enemies, every means of securing our safety is honourable. For laws are silent when arms are raised, and do not expect themselves to be waited for, when he who waits will have to suffer an undeserved penalty before he can exact a merited punishment. The law very wisely, and in a manner silently, gives a man a right to defend himself, and does not merely forbid a man to be slain, but forbids any one to leave a weapon about him with the object of slaying a man; so that as the object and not the weapon itself, is made the subject of the inquiry, the man who had used a weapon with the object of defending himself would be decided not to have had his weapon about him with the object of killing a man. Let, then, this principle remembered by you in this trial, O judges; for I do not doubt that I shall make good my defence before you, if you only remember  what you cannot forget  that a plotter against one may be lawfully slain. Cicero’s works were well-known and widely admired throughout Christian Europe in the centuries when Latin was the second language of the educated class in every country. See also The Supreme Court on the Right to Keep and Bear Arms.